Myra Marx Ferree is the Alice H. Cook Professor of Sociology and Director of the European Union Center of Excellence at the University of Wisconsin, where she is also a member of the Gender and Women’s Studies Department. She is the author of Varieties of Feminism: German Gender Politics In Global Perspective (Stanford University Press, March 2012). 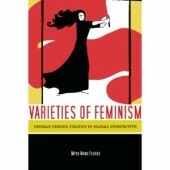 Other recent books include: Global Feminisms: Transnational Women’s Organizing, Activism, and Human Rights (co-edited with Aili Mari Tripp, NYU Press, 2006) and Shaping Abortion Discourse: Democracy and the Public Sphere in Germany and the US (with William A. Gamson, Jürgen Gerhards and Dieter Rucht, Cambridge University Press, 2002).